The Chinese authorities have been beefing up their repressive policies against members of the Uyghur minority in many places across their home region of East Turkestan. In Hotan, Lop, Keriye and Chira Counties rewards of up to US$ 72,000 have been offered to individuals who report on so-called “suspicious terrorist activities or suspicious individuals”. These include people who openly display their affiliation with the Uyghur community or their dissent from the Chinese Government’s policies. Authorities in northwestern China’s Xinjiang region are offering hefty sums of cash to would-be tipsters on terrorist activities, according to an official announcement issued in the aftermath of a deadly attack carried out by a group of Muslim ethnic Uyghurs last month. In a 23 February 2017 statement recently obtained by RFA’s Uyghur Service, the Hotan (in Chinese, Hetian) prefecture government said 100 million yuan (U.S. $14.5 million) had been set aside to reward residents reporting “suspicious” acts following the knife attack a week earlier in Guma (Pishan) county. “Our region will create an anti-terror defense front composing every ten families as a unit, and an anti-terror reward fund in order to encourage the masses to actively provide tips related to terrorism,” the announcement reads. The announcement said authorities would guarantee the anonymity of informants and secretly transfer funds to their bank accounts, if requested. Anyone exposing high-ranking members of the community involved in suspicious activity will be handsomely rewarded for their information. “Tip providers who report on ‘double-faced’ cadres, party members or ‘double-faced’ religious clergy will receive 200,000-500,000 yuan (U.S. $28,970-72,426),” the announcement said. The focus on rooting out top-level “terrorists” echoed points in a speech on maintaining stability by Xinjiang Party Secretary Chen Quanguo earlier this year, calling for the “severe punishment” of “double-faced” cadres and religious clergy in the region. A second announcement, issued 28 February 2017 by the Chira (Cele) county government, offered similar rewards to local residents for reporting on their neighbors. “Tip providers who report on the suspicious activities of individuals returning from overseas travel will receive 10,000 yuan (U.S. $1,449),” the Chira announcement said. 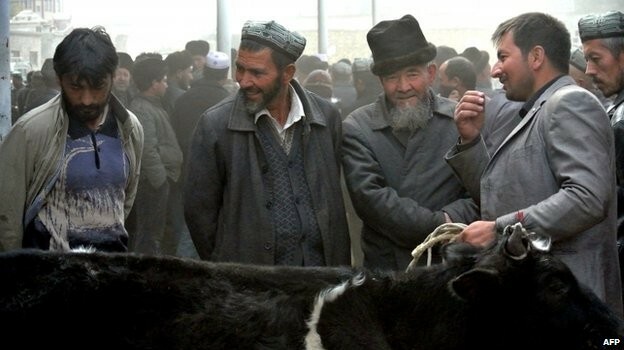 Those who report individuals for having “stitched the ‘star and crescent moon’ insignia on their clothing or personal items” or the words “East Turkestan”—referring to the name of a short-lived Uyghur republic—on their mobile phone case, purse or other jewelry, are also eligible to receive 3,000 yuan. Offering rewards to informants is the latest move in a bid by authorities to increase security in Hotan, where a Feb. 15 attack by three Uyghurs in a residential area of Guma county left five passersby dead and another five injured, with the attackers themselves shot dead by police, according to state media. The attack appears to have been motivated by anger at threats by local officials to punish the attackers for praying with their family, an activity outlawed by authorities in an effort to restrict Muslim religious practice in Xinjiang, sources told RFA. On Feb. 16, authorities in nearby Keriye (Yutian) county announced a move to add 254 additional auxiliary members to its police force, with 204 jobs reserved for ethnic Uyghurs and 50 spaces held for Han Chinese, local media reports said last week. RFA was able to confirm that rewards were being offered to informants in at least two other counties in Hotan—Keriye and Lop (Luopu) counties—after speaking with police officers in local townships. But officers from two other townships in Keriya—Siyek and Kokyar townships—confirmed that several tipsters had made contact with local authorities in the weeks since the Hotan government issued its announcement. “Tip providers or situation reporters directly meet with township party secretary or township security personnel,” said an officer from the Siyek station. A police officer in Kokyar township told RFA that “tip providers from the township and villages [are] coming in to report suspicious things or individuals,” adding that some had called the police station directly. “There were tip providers from the Hotan region who received a monetary reward,” said the officer, who did not provide his name. The officer said that it was normal for neighbors to “spy on one another” and “watch one another’s activities in the township and area villages. “Every ten families are organized as a group to watch one another,” he said. Ilshat Hassan Kokbore, president of the Uyghur American Association (UAA) exile group, compared Hotan’s reward system to tactics used in Nazi Germany, under Stalin in the Soviet Union and in Mao Zedong’s China during the Cultural Revolution, and said it was likely to backfire in Xinjiang. “For the Chinese government—especially in the Hotan region—to throw some crumbs to the Uyghur people and encourage them to spy on their own is nothing short of pushing those living under its authoritarian rule into a moral crisis that will result in tragedies of conscience,” Kokbore said. While China blames Uyghur extremists for terrorist attacks, experts outside China say Beijing has exaggerated the threat from the Uyghurs and that repressive domestic policies are responsible for an upsurge in violence there that has left hundreds dead since 2009.